Thanks to sophisticated mobile and web technologies, the wide availability of video chat software, and applications with natural language and speech processing capabilities, language learners have more, and more varied, opportunities to learn. Computer-based learning contexts such as these offer compelling new features, yet the impact of these features is not always well understood. This thesis draws on recent developments in L2 motivation theory to advance our understanding of learners' affective experiences in computer-based spoken L2 grammar practice, and to explore learners' motivations for learning Dutch as an L2. The platform employed is innovative for its use of Automatic Speech Recognition technology to provide oral grammar practice with automatic corrective feedback on word order errors. Learners tend to prefer having their errors corrected, but feedback can result in negative emotional reactions which may undermine learning. 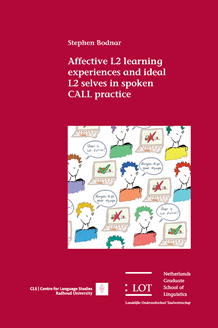 We investigated this issue by comparing learners' affective experiences in grammar practice with and without feedback, using a design which periodically paused practice to survey learners' affective states, while a logging module collected performance data. Learners' motivations for learning Dutch are explored using a new instrument based on the L2 Motivational Self System, as a first step towards creating computer applications that adapt to the future hopes and concerns of individual learners. Together, the findings suggest that self-study practice is a context where feedback can be provided safely, that affective experiences are linked to learning, and that individuals have diverse motivations for learning an L2 which could be taken into account in pedagogical design.